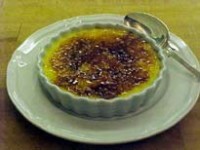 Here is a recipe for that old favorite Creme Brulee updated with the flavor of Meyer lemon. 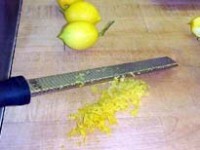 It is so delicious that it is worth begging, borrowing, or stealing Meyer lemons wherever you can find them. Using a blowtorch to caramelize the sugar on top is fun and exciting. A regular blowtorch works fine. 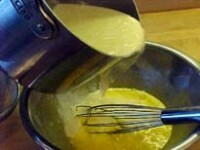 To make the custard, heat the cream with the zest in a saucepan over medium high heat. 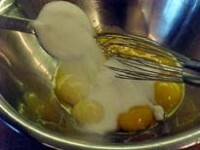 Put the yolks with the 4 Tbs. sugar in a large bowl. Whisk until light in color. Slowly stir in the scalded cream. 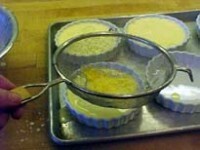 Strain the mixture into six or eight ramekins or ceremic tart molds. Place the molds on a baking sheet and cover with one piece of foil. Bake in a 325 degree oven until the custard is barely set, about 30 minutes. Cool at room temperature then refrigerate covered until ready to serve. 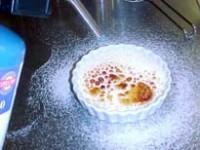 To brown the tops of the Creme Brulee, put the remaining sugar in a fine sieve. Shake the sugar over the custards making an even layer. Use a blow torch to brown the sugar to create a crust. Do not refrigerate again before serving.